Going places ESL lesson plans can take your students from the corner convenience store to the far corners of the globe. Planning a Vacation: Students can use their reading, writing, and speaking skills to select a travel location, book a flight, and create a sample itinerary. Planning a vacation also opens the door for students discussing their likes and dislikes and past vacations, and vacation practices around the world. Packing for a Vacation: Many times, clothing vocabulary is introduced by describing people and the clothes they are wearing. Packing for vacation can add a new twist to that standard lesson by giving the discussion of socks and shirts a context. Bring in an actual suitcase and clothing for a hands-on visual aid. Traveling Around Town: You don't have to journey far to be traveling, so going places ESL lesson plans can also include everyday trips like going to the grocery store or going to the dentist. These destination-specific lessons are great opportunities for developing specific vocabulary and can also be more practical for students than a lesson asking them to plan a world cruise. Transportation Options: Transportation options vary by region and travel distance, so your students may be using the subway, riding a bus, flying by plane, driving a car, or riding a bike. 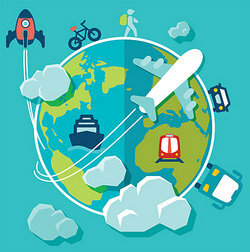 Each mode of transportation opens the door for unique vocabulary and practical English language learning. A lesson on driving by car could include information on visiting a mechanic, with students learning the words for flat tire and oil change. Traveling by plane can lead to an extensive lesson on the airport, including everything from finding parking to buying a snack. Directions: Learning how to ask for and give directions is another useful skill for the English language learner that blends perfectly with other travel-based lessons. Teachers can help students understand local street naming and numbering procedures. Vocabulary will include directions such as "to the right" and questions related to specific locations such as "How do I get to the museum from here?" Talking to Other Travelers: As people travel, they may strike up short conversations with the person sitting next to them on the bus, the person behind them in line at the airport, or a friendly ticket agent. This provides a great opportunity for teaching students how to introduce and describe themselves. They can role-play with classmates or practice written dialogues. Use authentic materials whenever possible. It's more useful for students to learn how to read a local bus schedule than to decipher a hypothetical chart the teacher printed. However, teachers should still be aware of their students' English abilities and select appropriate curriculum aids. For instance, a two-page list of subway stops may be overwhelming for their first contact with the schedule. Work your way up to the full schedule by using excerpts and samples first. Travel magazines and websites can be a good source of reading material. Make sure you are using copyrighted material appropriately before you photocopy an article, however. Fair use provisions allow for limited educational use in the United States. Other countries will have different regulations of which you should be aware. Dealbase.com is a great source to find hotel packages and deals all over the world. They display deals in a consistent format, organized by hotel and destination. Lanternfish offers a list of Survival English for Travelers lesson plans. Although the lessons are intended for complete beginners in learning the English language, teachers of any level can use the activities for inspiration. One of the available lessons is an ESL airport role-play activity for getting through customs. Students act as customs agents and travelers to practice this common encounter. The lesson includes downloadable role sheets to hand out to the students. Other lessons walk students through hotels, restaurants, and the post office. The Library of ESL Lesson Plans developed by Alamance Community College, part of the North Carolina Community College System, offers an entire unit on transportation and directions. Individual lesson plans teach students about directions, maps, and the Department of Motor Vehicles. Special Education Technology provides PictureSET to help non-verbal special education students express themselves. However, many of the illustrations would be useful for ESL students. For instance, the Travel in the Community category includes bus vocabulary. The Mall category includes several vocabulary lists that would be relevant for lessons on traveling locally. "Going Places ESL Lesson Plans." YourDictionary, n.d. Web. 22 April 2019. <https://esl.yourdictionary.com/lesson-plans/Going-Places-ESL-Lesson-Plans.html>.